Four hareidi-religious politicians and two prominent hareidi rabbis received identical letters containing threats, abusive language and white powder on Sunday and Monday. The envelopes were handed over to the police. 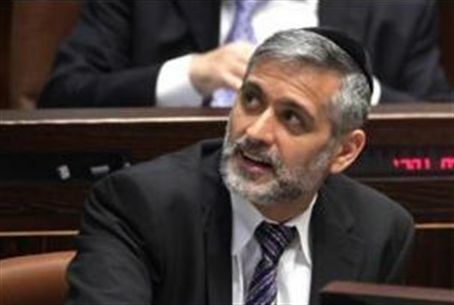 The first batch of letters arrived Sunday at the offices of Deputy Prime Minister Eli Yishai (Shas), Deputy Health Minister Yaakov Litzman (United Torah Judaism) and MKs Moshe Gafni and Uri Makleb (UTJ). On Monday, two more letters were received at the homes of Rabbi Menachem Erstner in Bnei Brak and Rabbi Shalom Cohen. Rabbi Erstner heads the Vizhnitz Yeshiva in Bnei Brak, and Rabbi Cohen is a member of Shas's Council of Torah Sages. "We, the enlightened residents of the State of Israel, demand that you, the people of darkness, stop living at our expense, studying all day without working, and refusing to serve in the army and do reserve duty. MK Menachem Eliezer Moses (UTJ) called on Knesset Speaker Reuven Rivlin Monday to help "tone down the hatred," as he put it. In a letter to Rivlin, Moses wrote: "Recently a campaign of terror is being conducted against the hareidi population and its institutions. Almost every day we hear in both written and broadcast media about attacks against hareidis on the streets, and about desecration of synagogues and other religious institutions, for no apparent reason." According to the Globes news site, the government's annual current budget for yeshivas is 975 million NIS. About 100,000 students receive monthly stipends of 475 to 855 shekels (between $130 and $240) per month.